Josef Silvestre, one of the earliest known Cabahug ancestors was identified in the records of San Fernando Rey Catholic Church at Liloan, Cebu. 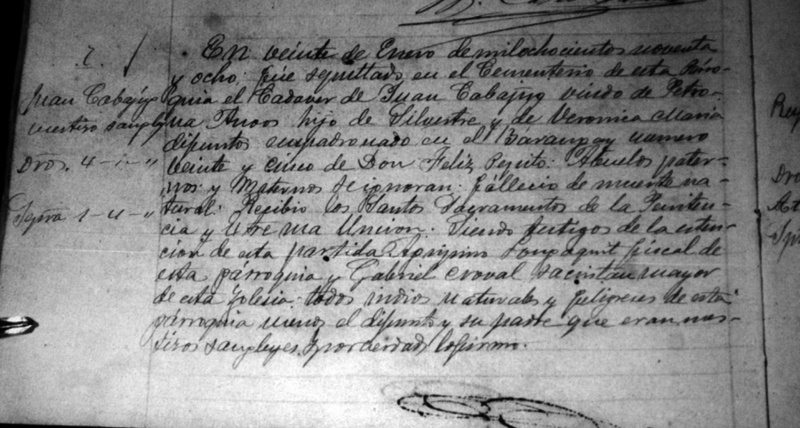 The names of Silvestre and his wife, Beronica Ysabel, were first found in the 1845 marriage record of his son, Francisco Cabahug4a. As with Jacinto Andres, the other early family member, Silvestre's name is typical of Filipino names prior to the introduction of surnames in 1850. Additional evidence showing Josef Silvestre was a Cabahug ancestor is found in the death records of Francisco Cabahug4a, and Juan Cabahug4a. Each of these records lists the parents of the deceased as Silvestre and Veronica Maria. Judging from entries for his children in the Liloan Church records, Josef Silvestre was born in the late 1700's, probably between 1780 and 1790. Early in 1800, he married Beronica Maria and they had at least three children. 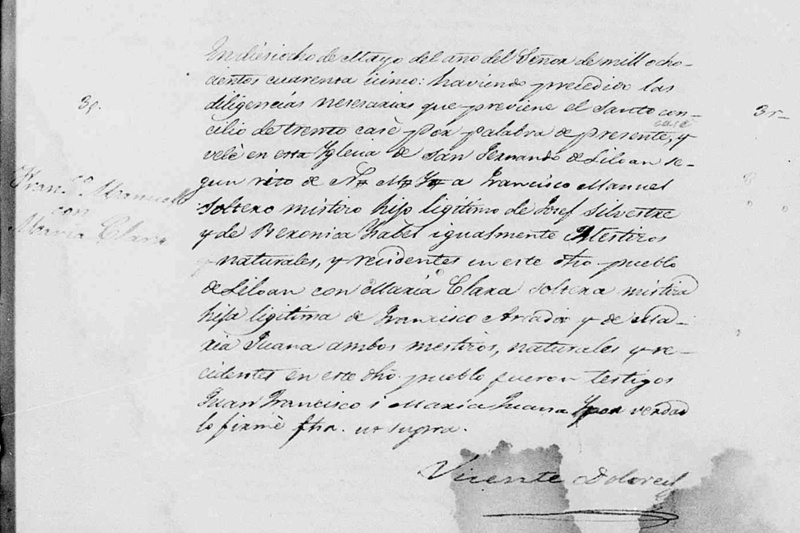 The marriage record of Francisco Cabahug, states that both Silvestre and Beronica were Mestizos and born in Liloan Until 1845, present day Liloan was part of the historical town of Mandaue. Josef Silvestre's death is not found in the Liloan church records, indicating that he died before 1845. However, Beronica Maria died in Liloan on August 29, 18584a. Her death record reads, "Beronica Pepito, widow of Silvestre Cabajug"4a. This shows that Bernoica belonged to the Pepito family, a well known family in Liloan. The reference to her husband as Silvestre Cabajug, most likely reflects the family name given his children and other family members. Note also that the spelling of Beronica's given name reflects the local pronunciation of "Veronica". i. Juan Cabahug Juan died in January 18984a. He married Petrona Anoos. ii. Blas Cabahug Blas married Mauricia Pilapil. iii. Francisco Cabahug Francisco died in May 18994a. He married Clara Pilapil. Judging from the number of his children born before 18454a, Juan Cabahug is the oldest of Josef Silvestre's children. He was probably born in the second decade of the 18th century. Juan married Petrona Anoos, the daughter of Dionisio Anoos and Gregoria Maria. In 1843, Juan Ignacio (Juan's pre-1850 name) was one of seventeen Princilpales from the Visita of Liloan, Mandaue, who granted a power-of-attorney to Don Julian Bartlolme del Rosario. Presumably their intent was to arrange for Liloan to separate from Mandaue and become an independent town. The Town of Liloan was established by early 1845. Juan and Petrona lived in Barangay number twenty-seven, where Juan sereved as "Cabeza de Barangay" in the 1860's4a. Petrona died in July 18714a, and Juan died in January 18984a. i. Andres Cabahug Andres married Pelagia Cañete. ii. Dionisio Cabahug Dionisio married Ciriaca Pacul, the daughter of Juaquin Pacul and Donata Cuyos, on February 8, 18644a. Dionisio and Ciriaca had nine known children4a. iii. Eleno Cabahug Eleno married Crisanta Villamor4a. Eleno and Crisanta had two known children4a. iv. Agripino Francisco Agrepino Francisco was born on November 7, 18454a. v. Alejandra Cabahug Alejandra was born on February 19, 18484a, and died in 1914. She married Nicolas Pitogo, the son of Santiago Pitogo and Hilaria Mercader4a. vi. Pio Cabahug Pio was born on May 4, 18504a, and died in 19274a. vii. Victoriana Cabahug Victoriana was born on November 2, 18524a. viii. Demetria Cabahug Demetria was born about 18544a. She married Tito Maglasang, the son of Anatalio Maglasang and Catalina Gosal4a. Tito and Demetria had one known child4a. ix. Patricio Cabahug Patricio was born on March 17, 18554a. He married Maria Cañete, the daughter of Pascual Cañete and Oliva Pilones, on October 12, 18744a. Patricio and Maria had five known children4a. x. Timotea Cabahug Timotea was born on August 21, 18574a. xi. Romualdo Cabahug Romualdo was born on January 31, 18604a. He married Epifania Cuyos, the daughter of Mateo Cuyos and Evarista Lauron, on July 15, 18794a. They had two known child4a. xii. Gregoria Cabahug Gregoria was born May 8, 18644a. She married Juan Sanchez, the son of Alejandro Sanchez and Bernardina Pilapil, on July 29, 18844a. Juan and Gregoria had six known children4a. Further information (names, places and dates) on the descendants of Juan Cabahug can be found in the RootsWeb WorldConnect database. For a direct link is to his family in that database, click here. Blas Cabahug was probably born around 1820, as all his known children were born after 18454a. About 1840, he married, Mauricia Pilapil. Initially, Blas and Mauricia lived in Liloan, where Blas was "Cabeza de Barangay" of barangay number eighteen several times between 1867 and 18764a. In other years of this period his son, Gabino, was the "Cabeza de Barangay"4a. However, by the mid-1880's Blas and members of his family disappear from the Liloan Church records4a. Nothing further is known about them, except for his son, Gabino, who moved to San Remegio, Cebu, where he raised a large family26. i. Juan Cabahug Juan was born in July 18454a. He married Seferina Pilapil, the daughter of Pedro Pilapil and Apolinaria Hayag, on October 8, 18664a. Juan and Seferina had seven known children4a. ii. Gabino Cabahug Gabino was born on February 18, 18484a. He married Jorgea Pitogo. iii. Sergia Blasa Sergia Blasa was born on September 2, 18494a. iv. Seferina Cabahug Seferina was born on August 23, 18514a, and died in July 18874a. She married Higino Cantague, the son of Antonio Cantague and Gabriela Pilapil. Higino and Seferina had one known child4a. v. Nicolasa Cabahug Nicolasa was born in May 19534a. She married Clemento Ardrin, the son of Catalino Ardrin and Petrona _____, on December 3, 18844a. vi. Perfecto Cabahug Perfecto was born about 18554a. He married Silvestra Tagalog, the daughter of Mariano Tagalog and Roverta Cuyos, on June 10, 1879. Perfecto and Silvestra had known three children4a. vii. Manuelo Cabahug Manuelo was born on September 3, 18564a. viii. Gabino Cabahug Gabino was born on October 22, 18574a. He married Maria Tagalog, the daughter of Mariano Tagalog and Roverta Cuyos, on October 1, 18804a. ix. Dionisia Cabahug Dionisia was born on October 22, 18594a. She married Higino Pilapil, the son of Pedro Pilapil and Apolinaria Hayag, on July 11, 18824a. Higino and Dionisia had known two children4a. x. Serapia Cabahug Serapia had one child. Further information (names, places and dates) on the descendants of Blas Cabahug can be found in the RootsWeb WorldConnect database. For a direct link is to his family in that database, click here. On May 18, 18454a, Francisco Manuel married Maria Clara, the second marriage recorded in the records of San Fernando Roman Chatholic Church. 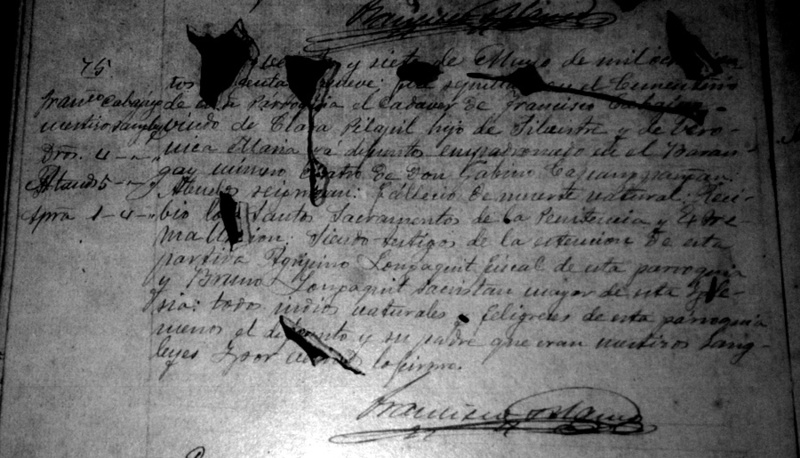 Later records show that Francisco Manuel took the surname Cabahug 1850 and that Maria Clara took the surname Pilapil4a. Clara Pilapil was the daughter of Arcadio Pilapil and Jauna Mercader. Based on his wedding date, Francisco Cabahug was probably born in the early to mid 1820's. Francisco and Clara lived in Barangay number twenty-nine, where he served as "Cabeza de Barangay" in the 1874's4a. Francisco also served as "Gobernadorcillo" (mayor) of Liloan4. This was an important office under the Spanish and indicates that Francisco was an leader in Liloan society. Clara died at Liloan in September 18944a, and Francisco died there in May 18994a. i. Tomasa Cabahug Tomasa was born on September 17, 18464a, and died in 19124a. Tomasa did not marry. She had one known child4a. ii. Maria Cabahug Maria was born on April 9, 18504a, and she died in October, 18614a. iii. Prudencio Cabahug Prudencio was born on April 27, 18524a. He married Telesfora Cabatingan, the daughter of Pedro Cabatingan and Roberta Jubay on October 6, 18744a. Telesfora was born about 18564a and died in December 18934a. Prudencio and Telesfora had twelve known children. iv. Domingo Cabahug Domingo was born on December 14, 18544a, and died in 19284a. He married Maria Delgado, the daughter of Marcelo Delgado and Magdalena Hatamosa. Maria died in October 18894a. Domingo them married Sofia Pepito. Domingo and Maria had six children4a and Domingo and Sofia had one known child4a. v. Isidro Cabahug Isidro was born on May 14, 18564a. He married Nicolasa Cañete, the daughter of Saturnina Cañete4a. Isidro and Nicolasa had twelve known children4a. vi. Sixto Cabahug Sixto was born on August 7, 18574a. He married Leona Herrera. Sixto and Leona had four known children4a. vii. Proceso Cabahug Proceso was born on July 1, 18594a. He married Hipolita Judaya in 18904a. Proceso and Hipolita had ten known children4a. viii. Segundo Cabahug Segundo was born about 18624a, and died in 19054a. He married Simona Gonzaga, daughter of Fermin Gonzaga and Paula Delgado, on February 8, 18874a. Segundo and Simona had eight known children4a. ix. Ignacio Cabahug Ignacio was born in 18634a. He married Isabel Pilapil, the daughter of Pedro Pilapil and Apolinaria Hayag, on May 29, 18834a. Ignacio and Isabel had ten known children4a. x. Cecilio Cabahug Cecilio was born in 18644a, and died in 19284a. He married Paula Herrera in 18824a. Cecilio and Paula had ten known children4a. xi. Eugenia Cabahug Eugenia was born in 18674a, and died in 19224a. she remained unmarried. xii. Tomasa Cabahug Tomasa was born in 18704a. xiii. Pastor Cabahug Pastor was born on August 6, 18714a, and died in September 19014a. He married Monica Pitogo, the daughter of Jose Pitogo and Fugina Tayagya. Further information (names, places and dates) on the descendants of Francisco Cabahug can be found in the RootsWeb WorldConnect database. For a direct link is to his family in that database, click here.